Be the first to share your favorite memory, photo or story of Georgette. This memorial page is dedicated for family, friends and future generations to celebrate the life of their loved one. MEXICO – Mrs. Georgette Leona Bellegarde Holmquist, 86, passed away Friday January 25, 2019 at her residence on Roxbury Road in Mexico surrounded by her family. Born in Andover, Maine on February 8, 1932 she was a daughter of Cyrille and Grace (Tanguay) Bellegarde. She was a graduate of Stephens High School class of 1952 and went on to get a certification in Mechanics and CNA. She worked all her life until she retired at 67 years old. She worked cleaning offices and homes with her mother. She had the opportunity to work for the “SNOW’S” in Old Orchard Beach as a Nanny when she was a teenager. 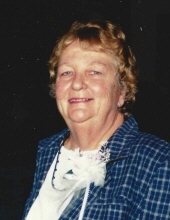 She worked for Androscoggin Home Health Care as a CNA and for Rumford Hospital. Georgette loved to travel and experience seeing the United States. She enjoyed hiking, swimming, sewing and many other activities. She loved camping at Dummer’s Beach with her family in the summer. Survivors include three sons, George of Boca Raton, FL, Craig of Peru, Paul and his wife Kristi of Dixfield; five daughters, Candace Holmquist, Valerie Marston and husband Garry, Melody Holmquist, Jacqueline Pettegrow and husband Gene, Andrea Holmquist all of Mexico ; brothers Conrad Bellegarde and wife Lois of Mexico, Lionel Bellegarde and wife Gloria of Clarksville, VA, Reginald Bellegarde of Rumford, Roland Bellegarde and wife Mary Ann of Rumford, Fern Bellegarde of Rumford, Pete Bellegarde of Dixfield; a sister, Mary Jane Gauvin of Springfield, MA; 16 grandchildren, 24 great grandchildren and 2 great-great grandchildren. She was predeceased by her loving husband Clifford, their son Clifford, Jr., her parents, sisters, Theresa Prevost and Frances Gallant, two brothers Eugene and Norman Bellegarde and great grandchild Christopher Dale. Friends and family are invited to sign the online guest book and share memories with the family at www.meaderandson.com. To plant a tree in memory of Georgette Holmquist, please visit our Tribute Store. "Email Address" would like to share the life celebration of Georgette Holmquist. Click on the "link" to go to share a favorite memory or leave a condolence message for the family.